Organ cuts of meat (aka offal) are superfood powerhouses. 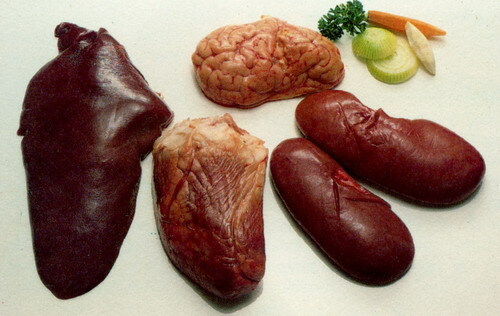 Liver, kidneys, tripe, heart and brain are highly dense sources of essential nutrients. They are especially high in mineral and vitamin content, and essential fatty acids; as well as Omega 3s. As an extra bonus, they are much cheaper than other cuts of meat and reduce food waste by encouraging a nose to tail eating approach. Over time organs meats have become unpopular and viewed as unhealthy (particularly in Western countries) when in fact the opposite is true. Organ meats have been traditionally consumed in many cultures for thousands of years. They were considered so precious that they were saved for the head of the family or tribe, oldest member in the community, pregnant women and the hunters! A traditional way to treat people for poor heart function was to consume heart. The theory was that eating organ meats would support organ functioning. Even in the animal kingdom predators such as lion, tigers and bear go for the liver first. The industrial revolution changed the way we purchased and consumed foods. This was the beginning of the boom for processed foods, hydrogenated oils and margarine (all of which we now know should not be consumed). Improvements in technology meant that the availability of meat increased, and therefore made it more affordable, and an increase in factory farming allowed for more meat to be produced. Fast forward to today and we know that factory farming not only produces poor quality cuts of meat, it also reduces the nutritional value and increases environmental issues such as pollution. Big supermarkets also changed the way we shopped. Instead of going to the butcher for your meat, and then going to the green grocer for your fresh fruit and veg it could now all be found under one roof. While this made shopping more convenient it has led to small independent family businesses going under, and causing a disconnection between the buyer and where their food comes from. There is a common misconception that liver and kidneys must store toxins as they are responsible for filtering and detoxing toxins. This is partly true – liver and kidneys do filter and detoxify toxins, but importantly, the organs don’t store the toxins. That said, like with any meat we consume it is important to go for high quality products, from free-range and grass-fed animals that are free from antibiotics or growth hormones. High in essential nutrients especially protein, vitamin B12, iron, selenium, zinc, vitamin A, B vitamins and phosphorus. Iron found in organ meats is more bio-available meaning you absorb more iron compared to iron found in other cuts of meat.